Luis Camnitzer, The Photograph, 1981, laminated photograph, 11 x 13 3/4”. “In learning how to write, the first step was always to fill pages with letters. In art, it was to fill pages with horizontal and vertical parallel lines,” wrote Luis Camnitzer in a recent essay for the e-flux journal. That the Uruguayan Conceptual artist and writer’s observation should conjure so much of his own visual work—on view in this retrospective spanning 1966 to the present—is perhaps not a surprise, but it does make for a nice parallel. See, for example, This is a mirror. You are a written sentence, 1966–68. A white wall sign announcing the title in five horizontal lines of black letters, the piece conflates text and image, while blending an economy of means with droll humor—two elements that mark the artist’s oeuvre. Quirkier in tone is Camnitzer’s large installation Living Room, 1969, a parlor furnished with photocopied words instead of the objects they stand for. But if the artist once trafficked in Conceptualist one-liners (1973’s Coca-Cola bottle filled with a Coca-Cola bottle is, naturally, a glass bottle filled with pieces of glass), the later works have a pithy poetry that triumphs. 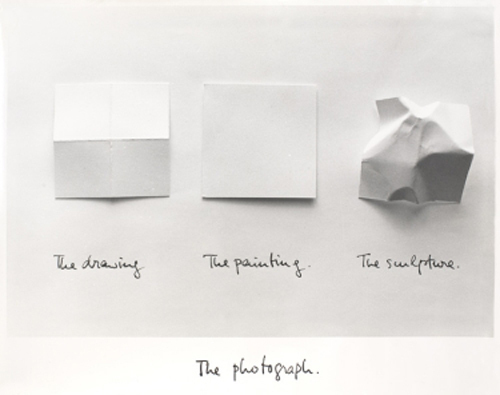 Pieces that address ideas of art production and the market are particularly evocative; among these is The Photograph, 1981, an image of three unique squares of paper, respectively captioned THE DRAWING, THE PAINTING, and THE SCULPTURE. As the latest works prove, Camnitzer’s practice has matured (visible, for instance, in the refinement offered by a pair of windows crafted from books and cement), but his initial concerns about the potentialities of text and art—and ramifications of the increasingly permeable boundary between the two—remain.